Four urban explorers had made 200+ jaunts into places they shouldn’t have but this time they got pinched. With the royal wedding soon approaching, security was tighter then usual and the police were not going to be as lenient with them as they otherwise might have been. The four were actually let go, but a recent incident (not involving any of the four) prompted the police to revisit the offenders and make what can only be described as a shocking “penalty”. In England there is such as thing called an ASBO (anti-social behavior order). It’s an alternative form of punishment to prison which involves some sort of a restriction, often not being allowed to do something or go somewhere for a period of time. In this case the four werent allowed to possess any materials that would aid in UE (no flashlights? really? ), no blogging about the subject of UE, but the shocker was that they could no longer be friends. You heard that right, the four best friends had to sever all ties between them. First off, do they really get to just make up punishments in England? Apparently when it comes to ASBO, yes they can. They’re special penalties, often custom taylored to the offense or defendant or both. Second, they can’t blog about it? free speech anyone? Oh wait this is England, so there’s no fourth amendment. Third, how can they release them, then months later decide to hit them w/an ASBO? Finally, not being friends any more? Aside from being impossible to enforce, it’s also maddeningly broad. What constitutes friendship? I’m sure they have mutual friends, what if they all get invited to the same party? Would one of them have to leave? How would they decide without speaking to determine who should leave? It’s mindboggling. I don’t know enough about ASBO’s to say much else, like whether they can appeal the decision or what would happen if they violated the order. All I know is that it’s patently foolish on the part of the police to even try to suggest that they not be friends any more. There are several tunnels or caves that were mentioned in and around Edgewater. I know where some of these are, others I do not. Edgewater is a very old town. Lenape Indians have inhabited this area for thousands of years. Pirates at one point were frequently in the area of Hudson County not far away. Fort Washington was located right where the GWB now connects to NYC. Prohibition caused many people and businesses to create hiding places for liquor. Any of these could be the source of these caves and tunnels. If anyone has any information on any of them I would love to hear from you.Anyone with information about any of these tunnels is urged to please contact me. First is a tunnel in The Palisades, supposedly just a few hundred yards from the GWB, just below the top of the cliff. Located (supposedly) directly beneath the old Riviera nightclub, it was hideout for liquor during Prohibition, but now serves as a place where the homeless hide out. I have looked several times and found nothing, and I am not climbing those cliffs for this. Not without a better idea of where I need to be looking. Just south of there, directly opposite where the Henry Hudson Dr exits from along the river onto River Rd is a gigantic colossal monstrosity called The Palisades. This huge condo tower sits on top of some old tunnel, pictured below. The wall that surrounds it resembles other small walls found up and down the Palisades, many of which date back to Revolutionary days. It is clear that the tunnel was sealed with concrete. Where or how far it went is anybody’s guess. Then there is the tunnel *under* River Rd, located in front of the Von Dohln Mansion. I searched the area once but didn’t find it and calls to the town historian have gone unreturned. The Von Dohln Marina sits perhaps 1/3 mile south of The Palisades, but I didn’t see any mansion. 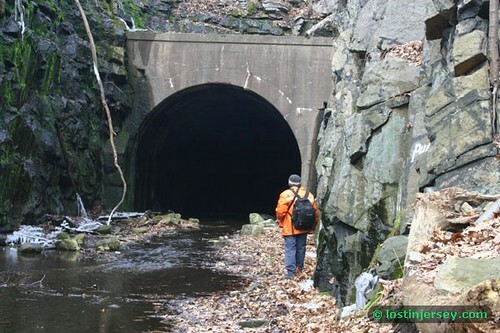 According to an article in Weird NJ, a sewer engineer stumbled onto what appear to be a very very old tunnel under the roadway which was a few feet wide but looked extremely dangerous and no one would go into it. Presumably it was sealed off. Where did it go? How deep? Who built it? Is it related to the one at The Palisades? Last but not least is the exit of the Fairview Tunnel. it originates under the Fairview cemetery, and travels straight for almost a mile before exiting near the southern end of town, somewhere near N40 48.856 W73 59.103. The area directly opposite it is now a mall, and I wonder what they will do with the opening as development comes closer & closer. The fence is lying in the water and presents no obstacle at all to curiosity seekers. I hear talk they may try to revive the rail line if the proposed ferry is created, as this would be a way to link up mass transit across the river with the railroad rider. Either way looks like something is going to happen to the tunnel at the east end for sure. and soon. It’s called a double bore tunnel (because it’s really two tunnels) but it’s also known as a backwards tunnel because the smaller tunnel is the one for vehicilar traffic while the larger tunnel is for the nearby river. It is designated as historic because the tunnel is 140 years old. 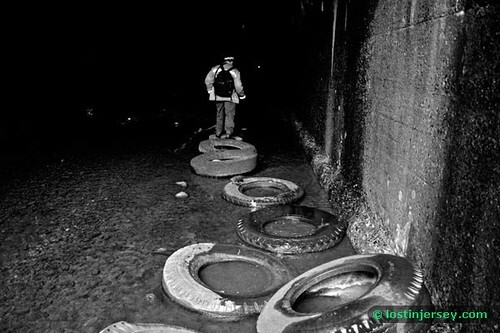 I know a little bit about the Pattenburg tunnel, but would appreciate any info anyone can provide me. 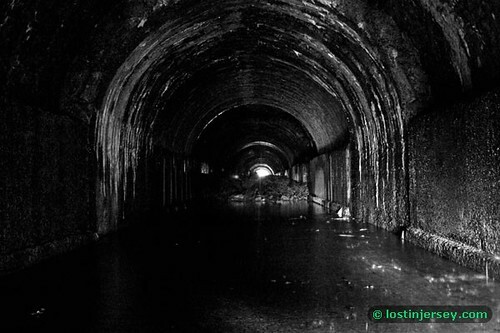 The Oxford railroad tunnel is part of the old Delaware, Lackawanna & Western Branch, and has been defunct for several decades. This line runs from the Muscontencong River to Washington where it joins an active Conrail Line. The northern part of this line will take you to the Manunka Chunk tunnel. Most railroad tunnels are wet from leakage of groundwater. The Oxford tunnel isn’t just wet, it’s got a river inside it, typically anywhere from 3 to 9 inches deep. The water that drains from it empties into the Pohatcong Creek. Enterprising explorers established a series of tires as a dry form of access to the occasion islands of dry dirt amidst the unending water. Reminds me of the tires you have to quickly run thru in high school, except here the idea is walk *on* the tires, not *in* them. Midway thru the mile long tunnel there is a roof collapse and the debris creates a dam about 4 ft high. Behind it is water of considerable depth, and supposedly trout breed in it…. 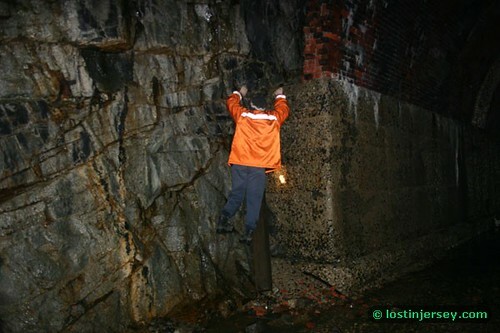 As we left the tunnel, my friend noticed a small crevice beside the mouth of the tunnel and decided to explore. He did his monkey impersonation and soon scuttled up and inside it. He emerged on top of the tunnel directly over the mouth as you can see below.